Whether you are looking for solitude and exploration on a remote section of beach, creating family memories with beach day trips, or fishing in world renowned waters, Outer Banks beach driving is a way to have a unique recreational experience on your next vacation. The use of off-road vehicles (ORVs) is a long-standing way for visitors to enjoy the ocean beaches and soundside waters. To provide for both visitor enjoyment and the protection of park resources, please observe the following regulations and recommendations when using ORVs on the beach. Corolla – No permit required to drive. * 4WD vehicles can access the beach at the northern end of NC 12 where the paved road ends. 4WD access south of this point is permitted between October 1 and April 30. Driving at night is allowed. ATVs allowed for residents with permit. Carova – No permit required to drive. * 4WD vehicles can access the beach at the northern end of NC 12 where the paved road ends. 4WD access north of this point is permitted year round. From there, visitors can enjoy miles of beach driving, scenic ocean views, and if they’re lucky, a glimpse of the wild horses, the area’s first and most treasured local residents. Duck – No public 4WD access. 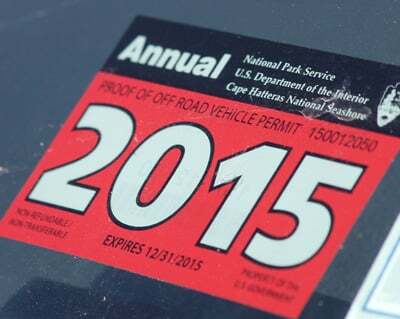 Private access allows vehicles vehicles on the beach between October 1 – April 30. 4WD A Must – Do not attempt to drive on the beach without a Four Wheel Drive (4WD) vehicle. Getting towed off the beach is extremely expensive. Drive slowly and be alert for people lying, standing or walking on the beach. Proceed with due caution and consideration for other beach users. Pedestrians always have the right of way. Please be especially cautious of children and pets who may dart into traffic. Watch for fishing lines. Tire Pressure – Lower the pressure on all tires. The softer the sand the lower the pressure needed. Generally drive with 20-25 lbs. pressure in the tires. When you return to paved roads, inflate the tires to normal as soon as possible. Driving – When possible, drive on the portion of the beach located just below the high tide mark. Avoid getting too close to the water. Before driving through any water, determine the depth and firmness of the underlying surface. Drive at a slow and steady speed. Speed limited on park beaches is 15 mph, unless otherwise posted. If the tires start to spin, back up in your tire tracks for several car lengths. Accelerate slowly as you move forward. Additional tire deflation may be necessary. When parked on the beach, leave room for two-way traffic to pass safely. Park along the shoreline in a single row of vehicles no more than one vehicle deep. Don’t Drive in the Water – Salt water spray is highly corrosive. It is recommended that you wash the vehicle after each outing, both sheet metal and undercarriage. If You Get Stuck – Park Rangers may assist you, but they are not permitted to pull or tow other vehicles. Commercial towing services are available. See our If You Get Stuck Section below about this. Do not litter – Please deposit all trash in trash containers wherever available or by bagging and removing it from the beach. Please avoid littering the beach with dead bait, carcasses or other dead fish of any kind. Spread Out – There’s plenty of beach for everyone. Avoid overcrowding any one area and displacing others from their previously chosen spots. Sand Holes – Refill holes and remove any boards or other aids after being stuck, leaving the beach passable for others. Drive only on marked ORV routes and comply with posted restrictions. Do not drive on or between the dunes. Driving or parking on vegetation is prohibited. Observe posted speed limits. The speed limit on park beaches is 15 mph unless otherwise posted. Any law applicable to vehicle use on a paved road in the State of North Carolina also applies to ORV use. A current driver’s license, valid vehicle registration, insurance and license plate are required for all vehicles – including ATVs. Reckless driving (ie: cutting circles or defacing the beach) is prohibited. Avoid driving or parking on the wrack line. The wrack line is a line of stranded natural debris on the beach left by a previous high tide that can be an important food source for birds. Open containers of any type of alcoholic beverage are prohibited in vehicles. Public consumption of spirituous liquors or fortified wines is prohibited. The use of seat belts is required. Do not hang out of moving vehicles or sit on the tailgate or roof. Those in truck beds must be seated on the floor with the tailgate closed. Children in truck beds must be accompanied by an adult. Check the weather forecast and tide tables before starting your trip. Gas Up – Fill your gas tank before driving onto the beach. There are no gas stations located in the four-wheel drive area. Tire Pressure – Before approaching the beach ramp (4WD area), stop in a legal parking area and adjust the air pressure to 15-20 psi in all four tires. This will provide more surface contact with the sand. Entering the Beach – Do not stop or park in the Corolla beach ramp area. Use 4WD onto the ramp and maintain a slow, steady speed, watching for pedestrians at all times. Driving – The speed limit on the beaches of Corolla is 35 mph. On the shore or beach strand, the speed limit is 15 mph when traveling within 300 feet of any person or animal. When approaching another vehicle, use your turn signal to indicate on which side you plan to pass. (It is customary to pass on the right, when practical). The other vehicle should respond with a corresponding signal. Parking – Vehicles parked on the beaches of Corolla must be parked in the area east of the dune line and west of the hard packed sand strip, adjacent to the water’s edge. No chairs, coolers, fishing lines, holes, trenches, or any other items are permitted to block the foreshore. Traffic Lanes – Parking or setting up beach equipment is not permitted in these lanes. Do not impede traffic by stopping, setting up beach chairs, digging holes, or building sand structures in the designated traffic lanes. Pedestrians – Remember to WATCH FOR PEDESTRIANS! The loud sound of the surf can make it difficult for people to hear approaching vehicles. In addition, children are often distracted and dart in front of cars. Wild Horses – Watch for wild horses while driving on the beach, especially at night. The horses roam the beach freely and many of them are dark in color, making them hard to spot at night. Because the wild horses are a protected resource and attraction, the laws are VERY strict about contact with them. Do not attempt to pet or feed them. You must remain at least 50 feet away from them at all times. Citations will be issued for those caught illegally interacting with the horses. There are several horse tours that companies that can get you within picture-taking distance while also giving you a great history lesson about the horses and the area itself. Tides – Be aware of the tides when beach driving in Corolla. The beach road becomes very narrow at high tide and people have been known to lose their cars if they aren’t careful! Cape Hatteras National Seashore PermitsObtaining an ORV permit is an easy process that takes only minutes from start to finish. 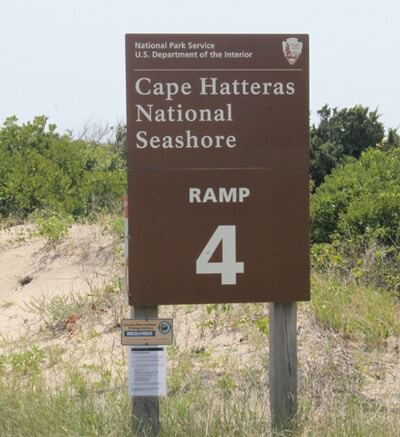 You can choose to visit an ORV office at Cape Hatteras National Seashore in person or you can visit the Cape Hatteras ORV Permit page at Recreation.gov. If you request a permit using the Recreation.gov website, you can choose to pick up the permit at an ORV office or have it mailed directly to you. ORV permits required. See above CHNS ORV permit information. Observe posted closures. Violators are subjected to a fine of up to $5,000 and/or imprisonment up to 6 months. Night Driving – During the sea turtle nesting season, from May 1 to November 15, driving on the Seashore’s beaches is prohibited from 9 p.m. to 7 a.m. Some portions of designated ORV routes may reopen to night driving on September 15 if there are no turtle nests in the area. Contact the park or check the website for permit information. November 16 to April 30 night driving is allowed. Pets/Leash Laws – See our Leash Law page. Beach Bonfires – See our Beach Bonfires page. Remove ANY trash or litter from the beach, including bait, fish parts or dead fish. Trash attracts predators. Feeding wildlife (including gulls) is prohibited. Human food is unhealthy for wildlife and may create a harmful dependence on humans for survival. Feeding may artificially inflate animal populations, create aggressive behavior and force other species out of habitat. Kite flying and frisbee tossing are prohibited within or above any bird closure. Kites and frisbees can scare birds off their nests, leaving eggs and chicks exposed to predators and deadly heat. Fireworks and metal detectors are not permitted. Jet Skis and other motorized personal watercraft are not allowed. Return all fish not being kept back to the water alive, including skates and sharks. Camp ONLY in designated campgrounds, not on the beaches. Do not dump wastewater or graywater on the beach. Please use park dump stations for this purpose. Yes, getting stuck is always a risk when it comes to beach driving, but drivers on the Outer Banks find the risk is most certainly worth the reward. Even the most seasoned local beach driver can get stuck on the sand from time to time, and with a few extra precautions ahead of time, getting stuck on the beach can easily turn into a funny vacation story, instead of a frustrating vacation headache. Before you hit the sand, make sure you have a shovel, two 2′ x 4’s (about 4-6′ ft. in length), and a tow rope, which can be purchased at virtually any hardware store. If you feel yourself getting stuck in the sand, do NOT try to force your way out. Spinning your tires will only drag you deeper down into the soft sandy ruts. Start digging behind or in front of your tires, depending on where your tires are lodged the deepest, and where the easiest route off the patch of sand is. Once an uphill path is created, you can try to move the vehicle again, or you can lay down the 2′ x 4’s, giving your vehicle some stable ground to drive on. Still stuck? Chances are, if there is a vehicle passing by or parked up the beach, they will probably pause and assist you in getting out of the sand. This is where the tow rope comes in handy. Just be sure that the vehicle that is pulling you out is an equal size and weight or more, or else you very well might both get stuck in the process. As a last resort, there are a number of towing companies that are stationed throughout the beaches. Always on call, a local towing company can assist you year-round, and can have your vehicle out of the sand in no time.